The human milk is the ideal food for children. However, not all children can be breastfed by their mothers for different reasons. Human Milk Banks are in charge of collecting human milk to those children whose mothers cannot breastfeed. Nevertheless, the quality of milk is often affected by the pasteurization and freezing, using for their preservation. In order to preserve the nutritional and sanitary properties in human milk, we subjected it to pasteurization (85°C/5min), at high hydrostatic pressures (300MPa/10min), UV radiation (254nm/2h) and to spray drying (180°C). We determine immunoglobulins content in human milk before and after conservation processes, as well as determine its presence in serum of mice BALB/c strain, fed with powder human milk. Mice were fed during three months and divided in three groups: control, feed with human milk powder and feed with artificial formula. The mice were sacrificed and their immunoglobulins content was determinate by nephelometry in serum. Was found of immunoglobulins (IgG, IgA, IgM) in human milk after spray-dried, high pressures and UV irradiation process respect to fresh milk and there were no significant differences between these treatments. However, pasteurized milk was significant lower in immunoglobulins content (p≤0.05) than fresh milk. In the group mice fed with human milk, there was a higher content of immunoglobulins in comparison with control group and group fed with formula milk. In conclusion, after spray-drying treatment, high pressures and UV radiation, it is possible to conserve immunoglobulins content in human milk, but not in pasteurized milk. Mice fed human milk powder had better biological response than those fed formula milk. Scientific reports evidence the advantages of Human Milk (HM) as the natural food, which contains the necessary nutrients for children during their first year of life. The World Health Organization , informs that infant mortality is reduced when feeding with HM in the first months of life, as well as health benefits during adulthood. 4. Mature milk, in which the basic composition is water, carbohydrates, proteins, fats, vitamins, minerals and cellular components. Lower levels of α-Lactalbumin, lactoferrin, albumin, IgA, IgG and IgM than colostrum and transition milk . The average volume of mature milk produced by a woman is 700-900 mL/day during the first 6 months postpartum and 600mL/day in the second semester, with a caloric content of 65 to 70Kcal/dL . One of the most relevant properties of HM is the content of immunoglobulins A, G and M (IgA, IgG and IgM, respectively). The main biological effect of these elements is to regulate the immune response in the newborn and infant while theirimmune system reaches maturity . Due to the instability of the components of HM, some conservation processes has been used mainly heat treatments, whose effect is towards microorganisms, but affecting of the nutrients and other properties of human milk . Hanna et al. , was to measure antioxidant activity of fresh human milk in comparison with milk stored at refrigerator temperature and freezer temperature for two to seven days. They observed that to preserve the antioxidant activity of human milk, storage time should be limited to 48 hours in refrigeration. They concluded that is better refrigeration than freezing and thawing of human milk. However, the high pressures, spray-dried, UV-C and other procedures can be applied for its conservation, as described below. Pasteurization is a relatively mild thermal process (temperatures below 100°C in general) whose objective is the total elimination of the pathogenic microbial flora, in addition to inactivating harmful enzymes. This is used to prolong the shelf life of food for several days or months . Pasteurization in human milk has no significant effect on lipids (provide energy), protein, or zinc contents. However, it has been suggested that the pasteurization of milk could have a negative effect on growth of preterm infants, via reduced intestinal fat absorption related to destruction of bile salts stimulated lipase . In the Human Milk Banks need to pasteurize the milk that has been donated to eliminate microbiological hazards. They use two modalities of pasteurization at 63°C/30 minutes and at 75°C/15 seconds, ensuring the reduction in E. coli growth of 70.10% and 36.39%, respectively. Because human milk possesses antimicrobial activity after pasteurization, it’s recommended that preserved by low-temperature for their better conservation . The spray-drying process is widely used in many industrial applications. According to each application, the resulting granular material must possess certain properties that depend on the conditions under which the drying takes place, and whose dependence must be known in order to optimize the quality of the material obtained . There is a simultaneous exchange of heat and mass, between the air of the drying environment and the solid . Solis-Pacheco et al., developed a method of spray drying for human milk, which provides a better conservation respect to the nutritional properties in milk and guarantees a longer life compared to human milk pasteurized, stored in refrigeration or in freezing. They conclude that spray drying can be an adequate preservation process to guarantee the safety of the powdered product and keep nutritional properties in human milk . When applying UV-C radiation to fruits and vegetables, a phenomenon called “hermetic effect” occurs. This effect can improve the resistance to the attack of certain microorganisms such as molds and yeasts, due to it can stimulate the production of phenylalanine ammonia. Different types of meat (fish, chicken, beef) can be treated with UV-C light before cooling to reduce the microbial load in two or three log cycles (depending on the applied dose), which may increase, for several days, their useful life. However, it is possible that substances that initiate the oxidation of the food are generated. Therefore, the sensorial characteristics of the product may be modified. For this reason, recent research has verified its effectiveness, by applying to the product flashes or pulses of intense light, so that energy is quickly released to the surface of the product. The short exposure time limits the formation of these components, which makes these undesirable chemical modifications difficult . High pressure is a non-thermal process that causes the inactivation of microbial cells, without altering the sensory quality or nutrients of the food . This causes irreversible changes in the morphology of bacterial cells (<200MPa) as permeability of the cell membrane and denaturation of proteins by the unfolding of peptide chains (>300MPa) . Rodríguez Arreola et al. , evaluated the effects of different treatments (pasteurization, UV-C, high pressure, γ-irradiation and spray dried) applied to human milk, for study of antiradical effect and activity anticancer. Human milk powder treated by High pressure showed higher antioxidant activity, however, the value was not significantly higher as compared to the other treatments evaluated (p>0.05). Spray-dried human milk treated with high pressure, UV-C and γ-irradiation conserved its biological activity, thus it’s could be possible to apply this technology for their conservation in human milk banks. This study describes the changes in the levels of IgA, IgG and IgM in the HM, after four different preservation treatments and the effect of their administration on body weight, serum glucose levels and Ig’s in a murine model. Civil Hospital of Guadalajara has donated frozen samples of its human milk bank to process them, which were taken in a cooler to the laboratory for further analysis. It was used powder artificial formula NAN Nestlé®, first stage. This study was also approved by the Ethical Research Committee in May 2015. Human fresh milk was thawed and pasteurized at 85°C for 5min in hot water bath (Heidolph Laborota 4000, U.S.A.). The milk obtained was thawed and packed in sterile 250mL bags to vacuum seal (vacuum packer). Then, some bags were treated by a team of High Pressure Hydrostatic at a pressure of 300MPa (High Pressure Food Processor brand Avure Technologies®, U.S.A.) for 10 min, 45°C. Other samples were treated with a Spray dryer BÜCHI Mini Spray Dryer (B-29, Switzerland). Feeding milk at 25°C was homogenized. The operating parameters were: feed rate of 2mL/min, and air inlet temperature of 165°C, air outlet temperature of 80°C. Since the milk was previously dried, it was exposed to UV-C radiation (INDELAB 30/70 Serie RV®, Spain) at 254nm wavelength for 2 hours in laminar flow hood. Powder samples of HM with different treatments were reconstituted with approximately 10mL of injectable water PISA®, to restore the original humidity of them before processing, and fresh HM were centrifuged at 10000rpm for ten minutes at 4°C. The supernatant obtained was used to determinate the content of immunoglobulins IgA and IgG by nephelometry according to Montagne et al. , with the equipment Vital Scientific Selectra E Chemistry Analyzer, Netherlands. The aim of this analysis is to evaluate the immunoglobulins content in mice fed with human milk powder by spray dried, against the mice fed with formula milk. Mice male BALB-C/cAnNHsd strain obtained from UNAM-Envigo RMS Laboratory, México, D.F and housed in light-dark cycles of 12/12h, at 22±2°C, 50±4% humidity, with free access to food (Rodent Laboratory Chow, Purina Cat.5001) and water. The animals were handled for the production, care and use in accordance with the Rules for Research in Health Matters (Mexican Official Norms NOM-062-ZOO-1999, NOM-033-ZOO-1995). Mice weighting 20-25g were used for this test, which were divided in three groups: Group 1 was supplied with commercial feed and water; group 2, in addition to commercial feed and water, was supplied with 50µL of reconstituted human milk powder with injectable water every 12 hours; group 3 in addition to commercial feed and water, was supplied with 50µL of powdered formula milk NAN Nestle® (first stage) reconstituted with water for injectable use every 12 hours. Each mouse was weighed monthly (Precision Digital Analytical Scale 200x0.001g Profession®) and glucose was measured monthly pricking the tip of the mouse tail (Glucometer Kit On Call Plus Total Medic On Call®). After three months, rodents were sacrificed and serum and blood were collected for analysis of glucose and IgA, IgG and IgM [17,18]. Data was analyzed with the statistics software IBM SPSS Statistics v24 (IBM Inc., Chicago, IL, USA) and Graph Pad Prism v6.01 (2014 Inc. 2236 Beach Avenue Jolla, CA 92037). Results are given as mean± Standard Deviation (SD) or Standard Error of the mean (SE). The data distribution of clinical and laboratory variables were evaluated with Z Kolmogorov-Smirnov test. The clinical and laboratory characteristics of the study group were performed with Unpaired Student’s t-test or Mann Whitney U test, and ANOVA one way test and Tukey post hoc, or Kruskal-Wallis, (according to apply) to compare quantitative data. A two-tailed P-value less than 0.05 were considered statistically significant. Immunoglobulins content was determined in powder human milk submitted to different treatments as pasteurization, UV-C radiation, high pressure and spray drying. Results are presented according to different treatments applied and are expressed in percentage of concentration, considering fresh human milk immunoglobulins content as 100%. Immunoglobulins know to be thermolabile. Some researchers have reported that exposure to temperatures of 75°C of certain foods, such as cow milk, can reduce detectable isolated bovine IgG by 40% in 5min, and by 100% at 95°C for 15s . In this work, IgG had retention of 40.73% in pasteurized milk, which presented the greatest loss in milk compared to fresh human milk (Figure 1). In the case of IgA, retention was 51.84% and IgM 62.86%. These results agree with other study , where IgG presented in colostrum, showed a reduction when it was heat-treated (≥60°C). On the other hand, Espinosa et al. , reported losses (without specifying percentage) of IgG after having pasteurized human milk. Ogundele et al. , founded that IgA has a great reduction in pasteurized milk and it was concluded that the destruction of IgA is mainly caused by the effect of temperature (62.5°C) and not by the time used for pasteurization (30min). IgA is the predominant immunoglobulin in human secretions and due to this, it has been the most investigated, demonstrating that pasteurization affect them [21-23]. It should be noted that IgA retention in milk is very important because it prevents antigens from reaching the intestinal wall, neutralizing the action of toxins in the intestinal mucosa, and that breast milk is the only source of IgA for the newborn . Other researchers have reported that IgA decreases between 20% and 62% [21,25,26]. Another more recent study reported a reduction of 20% for IgA and 23% for IgG . It has been reported that heat exposure causes conformational changes in the IgG molecule . To this respect, antigen-binding activity of bovine IgG also is reduced after heat treatment . This is consistent with studies that suggest that the antigen-binding region of the immunoglobulin molecule is more thermolabile than the other regions of the molecule . Detectable IgG in colostrum whey was also reduced by heat treatment, but at a slower rate than for isolated IgG . Milk preservation process often includes heat treatment such as pasteurization or sterilization, commercial milk samples that have undergone a typical pasteurization process, including skim milk powder, can retain 25-75% of the IgG concentration compared with raw milk, while milk undergoing Ultra-High Temperature (UHT) pasteurization contains little detectable IgG . Nevertheless, antigen-specific IgG in milk is relatively stable under typical conditions of pasteurization when compared with that in UHT milk or cow milk-based infant formulas that undergo at high-temperature processing . In the case of IgM content has been reported in calostrum 17-21% [25,33], Castro et al. , concluded that IgM decreased with pasteurization, even have reported total loss of this immunoglobulin after this process . Ultraviolet (UV-C) irradiation has been used for decades to reduce the microbial load in drinking water. It is currently an emerging disinfectant technology for other foods. UV-C is highly germicidal, at wavelength between 250 and 270nm, . At these wavelengths the pyrimidine and purine bases of the DNA absorb the UV-C energy causing chemical reactions. These reactions lead to photoproducts such as pyrimidine dimers, pyrimidine adducts, pyrimidine hydrates, and may involve cross-links with proteins. Two types of photo-oxidation of proteins are known: Type 1 or direct oxidation were the protein structure (primarily side-chains) or the amino acids tryptophan, tyrosine, phenylalanine, histidine, cysteine and cysteine absorb the UV light resulting in the production of excited state species or radicals, and type 2 or indirect oxidation of proteins is caused by free radicals. UV-C irradiation causes photolysis and subsequently generates Reactive Oxygen Species (ROS) including hydroxyl. These generated ROS can then oxidize proteins and can impair their function . In this work, it was observed retention of 75.87of IgA, 89.54 of IgG and 70.74% IgM, in milk irradiated by UV-C at 254nm. Figure 1 shows that milk treated with this process could conserve higher concentration of immunoglobulins compared to pasteurization process respect to fresh milk, which means that children who consume human milk with any of these treatments may receive passive immunity thanks to immunoglobulin retention . IgG has shown to be able to cross biological membranes in addition to participating in the immune response, so that, having a retention of more than 80% it is possible to consider UV-C radiation as alternative for the preservation of immunoglobulins of human milk instead of pasteurization . IgG have been less investigated; however, the most of studies have found reduction using that method . In the case of formula milk, it was significate lower in content of IgA respect to fresh human milk and the rest of treatments, including pasteurization. In IgG and IgM, were not possible to detect them in milk formula. A study made by Teixeira et al. , in bovine colostrum treated with a commercial UV light flow-through machine caused a reduction in colostrum IgG of 42.2% compared with untreated colostrum. Although UV-C reduced significantly the bacterial counts for Listeria spp., Salmonella spp., and Streptococcus agalactiae. According with this authors, the use to treat colostrum for feeding calves must be careful and the potential loss of viable IgG taken into account. Human milk is difficult to treat with UV-C due to its high absorption coefficient, which increases with the total solids concentration, thus limiting the penetration depth of the photons . This limitation can be overcome with the application of a vertical flow of human milk around a UV-C source. Human milk irradiated with a UV-C dosage of 4683 J/l had a high retention rate of lactoferrin, lysozyme and IgA (87%, 75% and 89%, respectively) compared with holder pasteurization with 9%, 41% and 49%, respectively. Increasing total solids content possibly provides optical protection of UV- C photons whereas a low total solid content decreases the absorption coefficient of human milk [40,41]. Has been documented that IgG in colostrum is sensitive to pressure, heat, and acid, which affects the conformation of the immunoglobulin molecule and ultimately the immunological activity of the antibody . It was observed that treatment of caprine colostrum at a pressure of 500 MPa caused a reduction in IgG of 40% compared with untreated colostrum. In this study, there wasretention of 86.02% in IgG in human milk treated with high pressures . Although there is not enough information about what are the effects of HP in IgM, Sousa et al. , obtained not significant reduction in this immunoglobulin and IgG. In the case of IgA, content was 79.79 and IgM 83.70%. It has been documented that the application of high pressures (440MPa) affects the activity of IgA immunoglobulin . Others have reported that it could decrease the activity of bovine milk IgG by applying pressures greater than 276MPa . Meanwhile, Sousa et al. , applied pressures of 600MPa and it observed that there were similar or greater losses than pasteurization, while at pressures between 200 and 400MPa the immunoglobulin values were maintained. However, in this study 300MPa was applied and it was possible to obtained percentage of concentration higher than 70%. Concentrations of immunoglobulins obtained from human milk spray-dried were 77.94, 84.86 and 71.49% in IgA, IgG and IgM respectively, thus, this method could be a good option for conserving human milk in HMB. IgA is the predominant immunoglobulin in human secretions and it has been the most investigated, showing in all of studies that pasteurization affects it [19,22,23]. Due to breast milk is the only source of IgA for the newborn , the retention of this antibody in milk is very important because it prevents antigens to reach the intestinal wall, neutralizing the action of toxins in the intestinal mucosa. Has been documented that in general, immunoglobulins and other bioactive compounds are sensible to heat treatment, and, although spray drying process use high temperatures for drying food, as was explained in methodology, the losses of IgM and IgG were not significant respect fresh human milk (p<0.05) [12,44]. Breast-feeding has been recognized as the best protection for infants after birth and as such reduces the risk of diseases during the milk period. Compared with formula, human milk is very complex, providing both an optimal nutrition for the newborn and components with biological activities that drive the growth of the intestine and pancreas and contribute to the development of mucosal defenses . 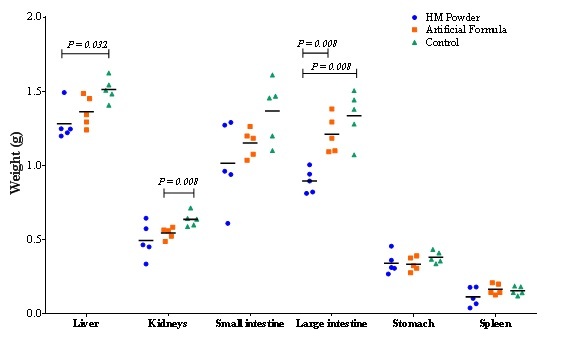 Differences in weight in mice treated with formula and human milk are shown in figure 2, where mice of the Control group (C) had significantly higher weight than the groups of HM and Formula Milk (FM) (P<0.05), increasing from the beginning to the end 4.47g, 2.77g and 0.02g in mice of groups C, FM and HM, respectively. 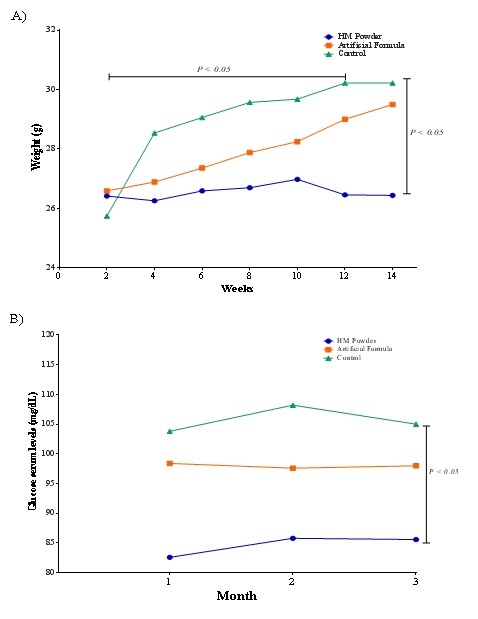 Groups C and FM significantly increased their weight (P≤0.05) during the 3 months of experimentation. These results could be related to the amount of food eaten by each group because control group consumed more food than group FM and HM. In addition, group FM consumed more food than group HM. Some researchers have reported that the satiety hormone leptin and the appetite-stimulating hormone adiponectin are also present in human milk. Although not transferred to the infant circulation in direct manner, levels of leptin and adiponectin from human milk have been found to correlate with levels of these hormones in infant serum [19,25] and are known to affect both appetite control and infant Body Composition (BC) [26,46]. In animal models (rat, mouse), injection of leptin into the fourth ventricle has been shown to delay gastric empty  and oral administration reduced food intake . In our work, we found different results because mice fed with FM consumed more food than mice fed with HM.In addition to this, whey protein is a high-quality nutritional protein that regulates food consumption and carries out other regulatory mechanisms, such as insulinotropicprotein among others. The groups that were treated with human milk or formula had administered protein in concentrations of 1.53% and .98% of the dose, respectively, providing satiety throughout the study and affecting the consumption of food . In the glucose measurement, no significant difference was found between the three groups, being higher in the group C, followed by the mice of FM and HM group (Figure 2). Something similar happened in glucose levels in study , where was found an increase in glucose determined during fourteen weeks in mice, in both studies it was concluded that glucose levels increase with age, although the difference between the three groups is related with amount of food consumed . On the other hand, organs of experimental mice were weighted in order to assess changes between different treatments. Results are depicted in figure 3, where a weight pattern of the organs related to the body weight of the mice of each group is observed similarly reported by other authors [51,52]. However, in the case of the small and large intestine, the AF group had a greater weight than the average of groups C and HM, being in the case of the large intestine a significantly greater weight than that of the other two groups. This may be worrisome since it could be related to constipation caused by the consumption of formula milk. According to Sabillón and Abdú , modified cow's milk casein (formula) forms a difficult-to-digest clot in the intestine, in contrast to human milk that forms small soft micelles. The gastric emptying of a child fed with human milk is done in 90 minutes, this related to a lower concentration of case in, while one fed with formula milk takes 3 hours. Artificial milk is low in fiber, which causes constipation in children, instead the human milk hydrates, due to there is a balance between fat and protein, producing soft stools . It has been reported that proteins from different Human Milk fractions such as whey and casein are resistant to proteolysis in the infant stomach  and the protein content of a food has also been shown to influence appetite and its regulation . Infant formula generally causes that gastrointestinal empty be more slowly than HM in term infants; further, formulas with different casein: Whey protein ratio exhibit different gastric empties rates. The weight of the liver in the human milk group was lower than the other treatments and statistically significant with the control, since the liver stores and manufactures the glucose, the results of the serum glucose content, the food consumption can be related. 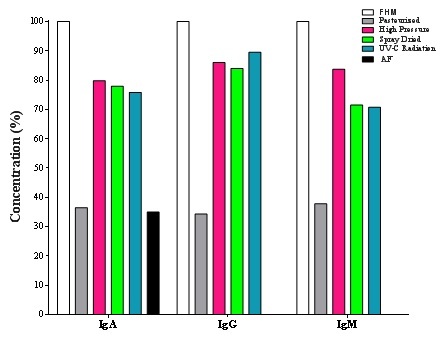 The immunoglobulin values in mice serum are shown in figure 4, some studies mention that the results were normal for the three groups in 3-month-old mice, having lower concentrations (P>0.05) the mice of group C [40,41], for IgG and no differences for IgA. The immune response of the mouse induces a greater production of immunoglobulins. This does not mean that they are those of human milk or formula, but that is because the immunoglobulins of the mouse produced in response to the detection of foreign molecules in their body . Therefore, the mice in the control group had lower levels compared to the other two groups. IgG antibody has been used for diagnosis to food reactions. IgG subclasses are of diagnosis value for food allergies, adverse reactions and their association with chronic symptoms. Due to nutrition plays an important role in immune response, the quantification and identification of specific IgG is very valuable . Regarding the immune response and the composition of HM, it has been reported the function ofHM oligosaccharides in the functioning of the infants' immune system and inflammation, as well as its use in the treatment of diseases in infants as well as adults . After treatments, spray drying, high pressures and UV radiation, values of immunoglobulin concentrations higher to 70% was observed in human milk, thus, any of this method could be an alternative process for the conservation of human milk instead of the pasteurization. The powder human milk used to feed the mice favored to a more rapid intestinal emptying, unlike mice that were fed commercial formula milk. The results obtained in this study represent a great advantage of powder human milk obtained by spray drying, over of infant formulas and cow's milk, which do not contain immunological factors. Therefore, the children who consume human milk treated with these processes, they will be benefited with the retained bioactive components, while their immune system reaches maturity. The authors express their acknowledgements to the Doctorate in Sciences in Biotechnological Processes of the University Center of Exact Sciences and Engineering (CUCEI) of the University of Guadalajara (U de G) for their support, and the Mexican National Council for Science and Technology (CONACYT) for financing this research. There is no conflict of interest between the authors. We all agree that the results of this work be published. World Health Organization, UNICEF (2003) Global Strategy for Infant and Young Child Feeding. World Health Organization, Geneva, Switzerland. García-López R (2011) Composition and immunology of human milk. Act Pediatr Mex 32:223-230. Shi YD, Sun GQ, Zhang ZG, Deng X, Kang XH, et al. (2011) The chemical composition of human milk from Inner Mongolia of China. Food Chem 127: 1193-1198. Hurley WL, Theil KP (2011) Perspectives on immunoglobulins in colostrum and milk. Nutrients 3: 442-474. Kramer MS, Aboud F, Mironova E, Vanilovich I, Platt RW, et al. (2008) Breastfeeding and child cognitive development: New evidence from a large randomized trial. Arch Gen Psychiatry 65: 578- 584. Hanna N, Ahmed K, Anwar M, Petrova A Hiatt M, et al. (2004) Effect to the storage on breast milk antioxidant activity. Arch Dis Child Fetal Neonatal Ed 89: 518-520. Watts S (2016) A mini review on technique of milk pasteurization. Journal of Pharmacognosy and Phytochemistry 5: 99-101. Picaud JC, Buffin R (2017) Human milk treatment and quality of banked human milk. Clin Perinatol 44: 95-119. Silvestre D, Ruiz P, Martínez-Costa C, Plaza A, López MC (2008) Effect of pasteurization on the bactericidal capacity of human milk. J Hum Lact 24: 371-376. Mondragon R, Julia JE, Barba A, Jarque JC (2013) Spray drying processing: Granules production and drying kinetics of droplets. Bulletin of the Spanish Society of Ceramics and Glass 52:159-168. Ángeles L (2009) Dimensionamiento y simulación de un secador por aspersión a nivel piloto. Tesis presentada para obtener el grado de Maestro en Ciencias en Bioprocesos. México. Solís-Pacheco JR, Rodríguez-Arreola A, Gutiérrez-Padilla J, García-Morales E, Martínez Preciado AH, et al. (2019) Human milk powderan alternative for better conservation and healthier use in the banks of human milk. CPQ Nutrition 3: 1-12. Guerrero BJA, Barbosa CGV (2004) Advantages and limitations on processing foods by UV light. Food Sci Tech Int 10: 137-147. Cheftel JC (1995) Review: High-pressure, microbial inactivation and food preservation. Food Sci Tech Int 1: 75-90. Farr D (1990) High pressure technology in the food industry. Trends Food Sci Technol 1: 14-16. Rodríguez Arreola A, Lacroix M, Solís Pacheco JR, García Morales E, Gutiérrez Padilla JA, et al. (2018) Assessment of the biological activity in human milk powder treated with different processes for their conservation. Journal of Food and Nutrition Research 5: 329-334. Montagne P, Laroche P, Bessou T, Cuillière ML, Varcin P, et al. (1992) Measurement of eleven serum proteins by microparticle-enhanced nephelometric immunoassay. Eur J Clin Chem Clin Biochem 30: 217-222. Castro AJ, Navarro HRE, Solís PJR, Salazar QIC, Macías LGG, et al. (2017) Impact of pasteurization/freeze-drying on available immunoglobulin content of the mature human milk. Use in human milk banking of hospitals. Nutr Hosp 34: 899-906. Espinosa-Martos I, Montilla A, de Segura AG, Escuder D, Bustos G, et al. (2013) Bacteriological, biochemical, and immunological modifications in human colostrum after holder pasteurisation. J Pediatr Gastroenterol Nutr 56: 560-568. Ogundele MO (2000) Techniques for the storage of human breast milk: Implications for anti-microbial functions and safety of stored milk. Eu J Pediatry159: 793-797. Viazis S, Farkas BE, Allen JC (2007) Effects of high-pressure processing on immunoglobulin A and lysozyme activity in human milk. J Hum Lact 23: 253-261. Permanyer M, Castellote C, Ramírez SC, Audí C, Pérez CFJ, et al. (2010) Maintenance of breast milk immunoglobulin A after high-pressure processing. J Dairy Sci 93: 877-883. Contador R, Delgado AJ, Delgado FJ, Cava R, Ramírez R (2013) Effect of thermal pasteurisation or high pressure processing on immunoglobulin and leukocyte contents of human milk. Int Dairy J 32: 1-5. Andreas NJ, Kampmann B, Le Doare KM (2015) Human breast milk: A review on its composition and bioactivity. Early Hum Dev 91: 629-635. Liebhaber M, Lewiston NJ, Asquith MT, Olds AL, Sunshine P (1977) Alterations of lymphocytes and of antibody content of human milk after processing. J Pediatr 91: 897-900. Goldsmith SJ, Dickson JS, Barnhart HM, Toledo RT, Eiten MRR (1983) IgA, IgG, IgM and lactoferrin contents of human milk during early lactation and the effect of processing and storage. J Food Prot 1: 4-7. Sousa GS, Delgadillo I, Saraiva AJ (2016) Human milk composition and preservation: Evaluation of high pressure processing as a non-thermal pasteurization technology. Crit Rev Food Sci 56: 1043-1060. Elizondo-Salazar JA, Heinrichs AJ (2008) Heat treating bovine colostrums 1. The Professional Animal Scientist 24: 530-538. Domínguez E, Pérez MD, Puyol P, Sánchez L, Calvo M (2001) Effect of pH on antigen-binding activity of IgG from bovine colostrum upon heating. J Dairy Res 68: 511-518. Chen CC, Tu YY, Chang YHM (2000) Thermal stability of bovine milk immunoglobulin G (IgG) and the effect of added thermal protectants on the stability. J Food Sci 65: 188-193. Li Chan E, Kummer A, Loso JN, Kitts DD, Nakai S (1995) Stability of bovine immunoglobulins to thermal treatment and processing. Food Res Int 28: 9-16. Mainer G, Dominguez E, Randrup M, Sanchez L, Calvo M (1999) Effect of heat treatment on anti-rotavirus activity of bovine colostrum. J Dairy Res 66: 131-137. Koening A, Albuquerque DEM, Correia BSF, Costa VFA (2005) Immunologic factors in human milk: The effects of gestational age and pasteurization. J Hum Lact 21: 439-443. Ford JE, Marshall VME, Reiter B (1977) Influence of the heat treatment of human milk on some of its protective constituents. J Pediatr 90: 29-35. Christen L, Lai CT, Hartmann B, Hartmann PE, Geddes DT (2013) Ultraviolet-C irradiation: A novel pasteurization method for donor human milk. PLoS One 8: 68120. Davies MJ, Truscott RJW (2001) Photo-oxidation of proteins and its role in cataractogenesis. J Photochem Photobiol B 63: 114-125. Chantry JC, Nommsen RLA, Peerson MJ, Cohen JR, Dewey GK (2011) Excess Weight Loss in First-Born Breastfed Newborns Relates to Maternal Intrapartum Fluid Balance. Pediatrics 127: 171-179. Goldman AS (1993) The immune system of human milk: Antimicrobial, antiinflammatory and immunomodulating properties. Pediatr Infect Dis J 12: 664-671. Peila C, Moro GE, Bertino E, Cavallarin L, Giribaldi M, et al. (2016) The effect of holder pasteurization on nutrients and biologically-active components in donor human milk: A review. Nutrients 8. Teixeira AGV, Bicalho MLS, Machado VS, Oikonomou G, Kacar C, et al. (2013) Heat and ultraviolet light treatment of colostrum and hospital milk: Effects on colostrum and hospital milk characteristics and calf health and growth parameters. Vet J 197: 175-181. Trujillo AJ, Castro N, Quevedo JM, Argüello A, Capote J, et al. (2007) Effect of heat and high-pressure treatments on microbiological quality and immunoglobulin G stability of caprine colostrum. J Dairy Sci 90: 833-839. Kielczewska K, CzerniexiczM, Michalak J, Brandt W (2004) The effect of high pressure on nitrogen compounds of milk. J Phys 16. Ewaschuk JB, Unger S, Harvey S, O’Connor DL, Field CJ (2011) Effect of pasteurization on immune components of milk: Implications for feeding preterm infants. Appl Physiol Nutr Metab 36: 175-182. Le Huerou Luron I, Blat S, Boudry G (2010) Breast-v. formula-feeding: Impacts on the digestive tract and immediate and long-term health effects. Nutr Res Rev 23: 23-36. Tomicic S, Johansson G, Voor T, Björksten B, Böttcher MF, et al. (2010) Breast milk cytokine and IgA composition differ in estonian and Swedish mothers-relationship to microbial pressure and infant allergy. Pediatr Res 68: 330-334. Bartolozo EQ, Candido LM, Colombo AO, Santos G (2010) Protein supplementation effects on human milk protein and A immunoglobin concentrations. Revista do Instituto Adolfo Lutz 69: 327-332. Fuentes M, Acosta L, Rodríguez P (2008) Perfil lipídico y glicemia en ratones NMRI, C57BL/6 y Balb/c producidos en la UCLA. Venezuela. Gaceta de Ciencias Veterinarias 13: 92-103. Luhovyy BL, Akhavan T, Anderson GH (2007) Whey proteins in the regulation of food intake and satiety. J Am Coll Nutr 26: 704-712. Fuentes YMM, Candela E (2003) Peso de los órganos en relación al peso corporal en ratones C57Bl/6 y NMRI/UCLA. Revista Científica 13. Sabillón F, Abdú B (1997) Composición de la leche materna. Honduras Pediátrica 15: 120-124. Major AS, Cuff CF (1996) Effects of the route of infection on immunoglobulin G subclasses and specificity of the reovirus-specific humoral immune response. J Virol 70: 5968-5974. Zeng Q, Dong SY, Wu LX, Li H, Sun ZJ, et al. (2013) Variable food-specific IgG antibody levels in healthy and symptomatic Chinese adults. PLoS One 8: 53612. Kulinich A, Liu L (2016) Human milk oligosaccharides: The role in the fine-tuning of innate immune responses. Carbohydrate Research 432: 62-70. Figure 1: Immunoglobulins content in human milk subjected to different preservation treatments. Note: Data are shown in x̄±SD. Differences between groups by One way ANOVA and Tuckey post Hoc, P<0.05 were considered statistically significant. FHM: Fresh Human Milk; AF: Artificial Formula. Figure 2: Weight and glucose serum levels analysis in vivo in BALB/c mice fed with different diet of milk throughout three months. Note: Data are shown in x̄. Differences between groups by Kruskal-Wallis and Mann Whitney U test, P<0.05 were considered statistically significant. HM: Human Milk. Figure 3: Weight of digestive system, liver and spleen in BALB/c mice after three months of fed with different diet of milk. Note: Shown plot data and x̄. Differences between groups by Kruskal-Wallis and Mann Whitney U test with P<0.05 were considered statistically significant. HM: Human Milk. 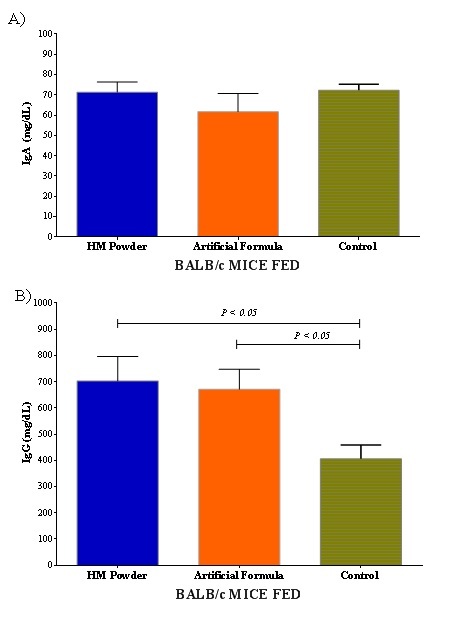 Figure 4: Immunoglobulins analysis in BALB/c mice after fed with different diet of milk. Note: Data are shown in x̄.Differences between groups by One way ANOVA and Tuckey post Hoc, P<0.05 were considered statistically significant. HM: Human Milk. Citation: Ariana RA, Raymundo SPJ, Elena NHR, Flavio SG, Arturo RSJ, et al. (2019) Assessment of the Content of Immunoglobulins in Human Milk Subjected to Different Preservation Treatments. J Food Sci Nut 5: 044. Copyright: © 2019 Ariana RA, et al. This is an open-access article distributed under the terms of the Creative Commons Attribution License, which permits unrestricted use, distribution, and reproduction in any medium, provided the original author and source are credited.